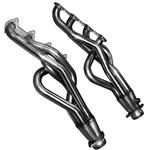 Street Performance exhaust kits from Ford Performance, Kooks Headers and more for your late model Mustang, Camaro and Challenger. Kooks Stainless Steel Catted H-Pipe, 2005-2010 Mustang, 4.0L V6 engine, 2-1/2" inlet size and outlet. Kooks Stainless Steel Catted Y-Pipe, 2005-2010 Mustang, 4.0L V6 engine, 2-1/2" inlet size and outlet. Kooks Stainless Steel Catted X-Pipe, 1996-1998 Mustang GT/Cobra/Mach 1, 4.6L engine, 2-1/2" inlet size and 2-1/2" outlet. Kooks Stainless Steel Off-Road X-Pipe, 1996-1998 Mustang GT/Cobra/Mach 1, 4.6L engine, 3" inlet size and 2-1/2" outlet. Kooks Stainless Steel Catted X-Pipe, 1999-2004 Mustang GT/Cobra/Mach 1, 4.6L engine, 2-1/2" inlet size and 2-1/2" outlet. Kooks Stainless Steel Catted X-Pipe, 1999-2004 Mustang GT/Cobra/Mach 1, 4.6L engine, 3" inlet size and 2-1/2" outlet. Kooks Stainless Steel Off-Road X-Pipe, 1999-2004 Mustang GT/Cobra/Mach 1, 4.6L engine, 3" inlet size and 2-1/2" outlet. Kooks Stainless Steel Catted X-Pipe, 1999-2004 Mustang GT/Cobra/Mach 1, 4.6L engine, 3" inlet size and 3" outlet. Kooks Stainless Steel Off-Road X-Pipe, 1999-2004 Mustang GT/Cobra/Mach 1, 4.6L engine, 3" inlet size and 3" outlet. Kooks Stainless Steel Catted X-Pipe, 2005-2010 Mustang GT, 4.6L engine, 2-1/2" inlet size and 2-1/2" outlet. Kooks Stainless Steel Off-Road X-Pipe, 2005-2010 Mustang GT, 4.6L engine, 2-1/2" inlet size and 2-1/2" outlet. Kooks Stainless Steel Catted H-Pipe, 2005-2010 Mustang GT, 4.6L engine, 2-1/2" inlet size and 2-1/2" outlet. Kooks Stainless Steel Catted X-Pipe, 2005-2010 Mustang GT, 4.6L engine, 3" inlet size and 3" outlet. Kooks Stainless Steel Off-Road X-Pipe, 2005-2010 Mustang GT, 4.6L engine, 3" inlet size and 3" outlet. Kooks Stainless Steel Cat Back System, 2010 Mustang GT/Shelby GT 500, 4.6L/5.4L engine, 2-1/2" inlet size and outlet. Kooks Catted Connection Pipe designed to fit the 2011-2014 Dodge 300C/Magnum/Chager/Challenger - SRT8 6.1L/6.4L Hemi with a Stainless Steel fiinish. These BBK X-pipes are made from 2-3/4" tubing and feature a merged X to maximize the potential of Ford's late model high performance engines. Each BBK mid X pipe offers performance, quality and value that guarantees years of top performance for your Ford Mustang. BBK Performance short mid X pipes are specifically designed to be used with BBK full length headers for 2011-13 Mustang GT to complete installation to your cat back exhaust system. ALL BBK full length X pipes are designed as direct bolt on to factory headers or any aftermarket shorty headers as well as of course BBK shorty headers.